Extraordinarily rare and mesmerising, natural fancy yellow diamonds sparkle with the most magical golden hues. Capturing the warmth of the South African sun, these valuable stones are extremely rare, making them highly sought-after. Shimansky natural fancy yellow diamonds are expertly hand-selected direct from Kimberley and the West Coast regions of South Africa before being transformed into remarkable jewellery creations. Like a ray of golden sunshine, the Shimansky Natural Fancy Yellow Diamond collection celebrates the unique qualities of the natural fancy yellow diamond in a range of jewellery creations that defines beauty and elegance. Available in various diamond cuts that maximise the yellow diamond’s brilliance such as cushion, radiant, square, oval and pear, the collection comprises striking rings, earrings, pendants and necklaces. 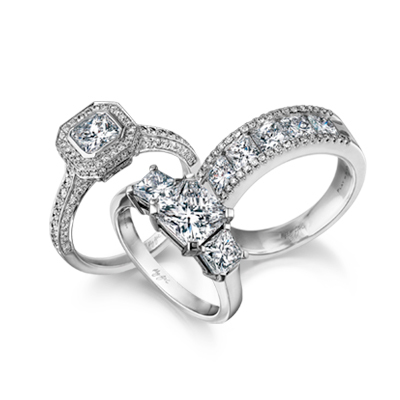 Natural fancy yellow diamonds are also used in certain Shimansky signature jewellery designs, such as the elegant Evolym Diamond Engagement Ring and the sought-after Millennium Diamond Engagement Ring. Elegantly set in fine gold or platinum, and often accompanied by micro-set white diamonds, Shimansky Natural Fancy Yellow Diamond jewellery creations allow you to take the African sun with you wherever you go. Natural fancy yellow diamonds are naturally striking, and make even more striking creations of jewellery. Bold and vivid, they are made to be noticed. Shimansky Natural Fancy Yellow Diamond jewellery creations are both eye-catching and elegant. Displaying a beautiful warmth of light, this dazzling collection will be enjoyed for generations to come. Celebrate the gift and hope that each day brings with a natural fancy yellow diamond from Shimansky. Diamonds that fall within the colourless index are valued for their absence of colour, as completely colourless diamonds are very rare. Colourless diamonds come in varying shades of white to yellow, and diamonds with slight traces of yellow or brown hues are significantly lower in value than those diamonds considered nearly colourless. The more rare a diamond, the higher its value. For every 10 000 nearly colourless diamonds mined, only one natural fancy colour diamond will be discovered. They are mostly found as small diamonds, less than a carat in weight. White or colourless diamonds are graded on a colour scale from D, the closest to colourless, to Z, heavily tinted yellow. It’s important to remember that a white diamond with a yellow tint or a Z colour grading is not the same as a natural fancy yellow diamond. A natural fancy yellow diamond’s colour is much deeper, more intense and vivid than that of a Z-coloured white diamond. Natural fancy colour diamonds fall outside of this grading spectrum, and are graded according to the intensity of their colour. Not all fancy coloured diamonds have the same depth of colour, and the more vivid the colour of the stone, the higher its value. Colour is the most important factor to consider when purchasing a fancy yellow diamond: even those that have a slightly lower clarity grade because of inclusions will be highly valued for their attractive colour. Natural fancy colour diamonds are formed when there is a presence of trace elements that interact with carbon atoms during the creation of the diamond. When this happens, the typical diamond crystal is distorted and the diamond’s colour can change. In the case of fancy yellow diamonds, the presence of nitrogen is the cause of the yellow colour. The nitrogen in natural fancy yellow coloured diamonds absorbs colour, giving them their yellow hue.